This exciting "specimen" from Geospace's Air Kicks line of active play Jumparoo toys is a pogo stick designed especially for smaller children (weighing 26 to 62 lbs). The funny frog sound effects ("Ribbit! Ribbit!! Ribbit!") that this jumper makes with each "hop" will inspire kids to hop all over the place! They will like to pretend they are a frog! All the while, they are staying active, developing their gross motor skills, and burning calories, but all they know is: "It's FUN!" 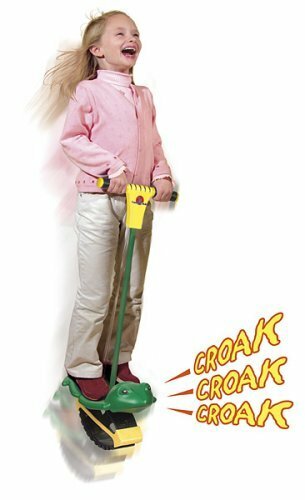 Kids adore its motion-activated, electronic frog sounds. And how easy it is to balance on on the Frog Pogo, thanks to its wide, non-marring base, and full-size foot platform. Now even the pollywogs of the family can enjoy the fun and exuberant exercise of JUMPAROO! For Riders Age 4 & Up with a body weight over 28 lbs (capacity is 62 lbs). There are Jumparoo Pogos for "kids" of all sizes and ages. Look for Jumparoo Boing! Pogo Sticks for children and adults, the Boing! JR for small kids, and the extreme sports JackHammer Pogo Jumper for teens and adults. If you have any questions about this product by Geospace, contact us by completing and submitting the form below. If you are looking for a specif part number, please include it with your message.